Tourists who were stranded on the three-mile long Lundy Island in the Bristol channel have returned to the mainland. 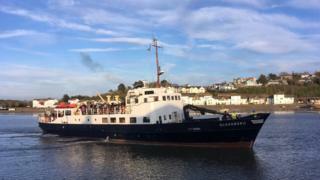 The MS Oldenburg arrived to collect 65 holidaymakers on Saturday but had a mechanical fault and was towed back. The Landmark Trust, which leases the island, found extra accommodation for those stranded in the island's lodges, campsite, wheelhouse, pub and church. They arrived back in Bideford on Monday evening. One returning visitor said "what happens in Lundy stays in Lundy", adding their party of nine had spent an extra £380 in the island's pub in the last two days. A Landmark Trust spokesman said: "While at the Lundy jetty, a rope got caught around the propeller in a huge swell so the mechanical fault unexpectedly prevented the ship from sailing. "Unfortunately sailing conditions prevented it returning on Sunday to collect passengers, so guests stayed an additional night." Visitors who had to return to the mainland urgently, including an eye surgeon and a patient with a scheduled operation, were transported back by lifeboat. Evacuee Jo King said: "They said there was a problem with the boat - they couldn't moor it properly - and they were worried it was going to break up overnight. "They were concerned the boat mattered most and we wouldn't be going back as planned." Mrs King and her husband Derek spent Saturday night in a room in the island's dairy. Mr King said: "It was very comfortable. There were people sleeping in the church, and in the old barn. But we were fortunate to end up in the dairy, which was as good as the accommodation we'd paid for." Blankets were also provided for some people to sleep on the floor in the island's Marisco Tavern pub. Lundy is a three-mile long island off the North Devon coast in the Bristol Channel. The island has been inhabited for 3,000 years with traces of Bronze and Iron Age settlements. It got its current name from the Vikings in the 9th Century, who called it Lund-ey, meaning Puffin Island. The island was sold in 1954 for £150,000 to the Landmark Trust and is kept as a "tranquil and unaffected place". A spokesman for the HM Coastguard told Devon Live it was informed about "a passenger vessel which was unable to take passengers from the Island of Lundy off the North Devon coast due to mechanical difficulties". It added: "Weather conditions made it impossible to fix the mechanical problem."